For related races, see 1864 United States elections. Presidential election results map. Red denotes states won by Lincoln/Johnson, blue denotes those won by McClellan/Pendleton, and brown denotes Confederate states; two Confederate states (Louisiana and Tennessee) were controlled by the Union by 1864 and held elections (although their electors were not ultimately counted). One elector in Nevada abstained. Numbers indicate the number of electoral votes allotted to each state. The United States presidential election of 1864, the 20th quadrennial presidential election, was held on Tuesday, November 8, 1864. In the midst of the American Civil War, incumbent President Abraham Lincoln of the National Union Party easily defeated the Democratic nominee, former General George B. McClellan, by a wide margin of 221-21 electoral votes, with 55% of the popular vote. For the election, the Republican Party and some Democrats created the National Union Party, especially to attract War Democrats. Despite some intra-party opposition from Salmon Chase and the Radical Republicans, Lincoln won his party's nomination at the 1864 National Union National Convention. Rather than re-nominate Vice President Hannibal Hamlin, the convention selected Andrew Johnson of Tennessee, a War Democrat, as Lincoln's running mate. John C. Frémont ran as the nominee of the Radical Democracy Party, which criticized Lincoln for being too moderate on the issue of racial equality, but Frémont withdrew from the race in September. The Democrats were divided between the Copperheads, who favored immediate peace with the Confederacy, and War Democrats, who wished to continue the war. The 1864 Democratic National Convention nominated McClellan, a War Democrat, but adopted a platform advocating peace with the Confederacy, which McClellan rejected. Despite his early fears of defeat, Lincoln won strong majorities in the popular and electoral vote, partly as a result of the recent Union victory at the Battle of Atlanta. As the Civil War was still raging, no electoral votes were counted from any of the eleven southern states that had joined the Confederate States of America. 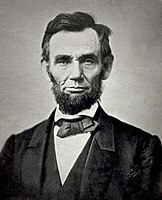 Lincoln's re-election ensured that he would preside over the successful conclusion of the Civil War. Lincoln's victory made him the first president to win re-election since Andrew Jackson in 1832, as well as the first Northern president to ever win re-election. Lincoln was assassinated less than two months into his second term, and he was succeeded by Andrew Johnson, who had to work toward emancipation of all slaves. Because Lincoln was elected on the National Union ticket, as the name the Republican Party used during the Civil War, he is technically the most-recent individual outside of the Republican or Democratic parties to win a presidential election. 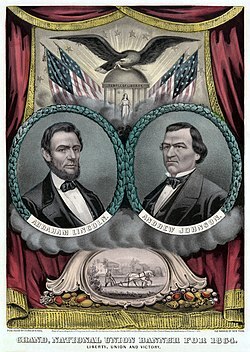 The Presidential election of 1864 took place during the American Civil War. According to the Miller Center for the study of the presidency, the election was noteworthy for occurring at all, an unprecedented democratic exercise in the midst of a civil war. A group of Republican dissidents who called themselves Radical Republicans formed a party named the Radical Democracy Party and nominated John C. Frémont as their candidate for president. Frémont later withdrew and endorsed Lincoln. In the Border States, War Democrats joined with Republicans as the National Union Party, with Lincoln at the head of the ticket. The National Union Party was a temporary name used to attract War Democrats and Border State Unionists who would not vote for the Republican Party. It faced off against the regular Democratic Party, including Peace Democrats. The 1864 presidential election conventions of the parties are considered below in order of the party's popular vote. As the Civil War progressed, political opinions within the Republican Party began to diverge. Senators Charles Sumner and Henry Wilson from Massachusetts wanted the Republican Party to advocate constitutional amendments to prohibit slavery and guarantee racial equality before the law. Initially, not all northern Republicans supported such measures. Democratic leaders hoped that the radical Republicans would put forth their own ticket in the election. The New York World, particularly interested in undermining the National Union Party, ran a series of articles predicting a delay for the National Union Convention until late in 1864 to allow Frémont time to collect delegates to win the nomination. Frémont supporters in New York City established a newspaper called the New Nation, which declared in one of its initial issues that the National Union Convention would be a "nonentity". Before the election, some War Democrats joined the Republicans to form the National Union Party. With the outcome of the Civil War still in doubt, some political leaders, including Salmon P. Chase, Benjamin Wade, and Horace Greeley, opposed Lincoln's re-nomination on the grounds that he could not win. Chase himself became the only candidate to contest Lincoln's re-nomination actively, but he withdrew in March when a slew of Republican officials, including some within the state of Ohio upon whom Chase's campaign depended, endorsed Lincoln for re-nomination. Lincoln was still popular with most members of the Republican Party, and the National Union Party nominated him for a second term as president at their convention in Baltimore, Maryland, on June 7–8, 1864. The party platform included these goals: "pursuit of the war, until the Confederacy surrendered unconditionally; a constitutional amendment for the abolition of slavery; aid to disabled Union veterans; continued European neutrality; enforcement of the Monroe Doctrine; encouragement of immigration; and construction of a transcontinental railroad." It also praised the use of black troops and Lincoln's management of the war. 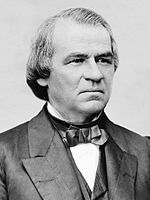 Andrew Johnson, the former senator from and current military governor of Tennessee, was named as Lincoln's vice presidential running-mate. The choice of Andrew Johnson as Lincoln's running mate was a politically calculated move by the Republican Party to ensure the electoral votes of the border states. Others who were considered for the nomination, at one point or another, were former Senator Daniel Dickinson, Major General Benjamin Butler, Major General William Rosecrans, Joseph Holt, and former Treasury Secretary and Senator John Dix. "How the War Commenced and How Near It Is Ended" published by the National Union Executive Committee. The Democratic Party was bitterly split between War Democrats and Peace Democrats, a group further divided among competing factions. Moderate Peace Democrats who supported the war against the Confederacy, such as Horatio Seymour, were preaching the wisdom of a negotiated peace. After the Union victory at the Battle of Gettysburg in 1863, moderate Peace Democrats proposed a negotiated peace that would secure Union victory. They believed this was the best course of action, because an armistice could finish the war without devastating the South. Radical Peace Democrats known as Copperheads, such as Thomas H. Seymour, declared the war to be a failure and favored an immediate end to hostilities without securing Union victory. George B. McClellan vied for the presidential nomination. Additionally, friends of Horatio Seymour insisted on placing his name before the convention, which was held in Chicago, Illinois, on August 29–31, 1864. But on the day before the organization of that body, Horatio Seymour announced positively that he would not be a candidate. Since the Democrats were divided by issues of war and peace, they sought a strong candidate who could unify the party. 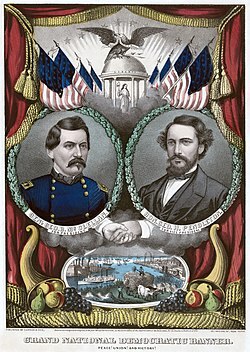 The compromise was to nominate pro-war General George B. McClellan for president and anti-war Representative George H. Pendleton for vice-president. McClellan, a War Democrat, was nominated over the Copperhead Thomas H. Seymour. Pendleton, a close associate of the Copperhead Clement Vallandigham, balanced the ticket, since he was known for having strongly opposed the Union war effort. The convention adopted a peace platform – a platform McClellan personally rejected. McClellan supported the continuation of the war and restoration of the Union, but the party platform, written by Vallandigham, opposed this position. The Radical Democracy Convention assembled in Ohio with delegates arriving on May 29, 1864. The New York Times reported that the hall which the convention organizers had planned to use had been double-booked by an opera troupe. Almost all delegates were instructed to support Frémont, with a major exception being the New York delegation, which was composed of War Democrats who supported Ulysses S. Grant. Various estimates of the number of delegates were reported in the press; The New York Times reported 156 delegates, but the number generally reported elsewhere was 350 delegates. The delegates came from 15 states and the District of Columbia. They adopted the name "Radical Democracy Party". A supporter of Grant was appointed chairman. The platform was passed with little discussion, and a series of resolutions that bogged down the convention proceedings were voted down decisively. The convention nominated Frémont for president, and he accepted the nomination on June 4, 1864. In his letter, he stated that he would step aside if the National Union Convention would nominate someone other than Lincoln. John Cochrane was nominated for vice-president. 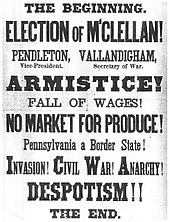 A National Union poster warns of a McClellan victory. An anti-McClellan poster from Harper's Weekly, drawn by Thomas Nast, showing rioters assaulting children, slave-catchers chasing runaway slaves, and a woman being sold at a slave auction. The 1864 election was the first time since 1812 that a presidential election took place during a war. For much of 1864, Lincoln himself believed he had little chance of being re-elected. Confederate forces had triumphed at the Battle of Mansfield, the Battle of the Crater, the Battle of Brice's Cross Roads, the Battle of Kennesaw Mountain and the Battle of Cold Harbor. In addition, the war was continuing to take a very high toll in terms of casualties with campaigns such as Grant's Overland Campaign and the perceived lack of progress. The prospect of a long and bloody war started to make the idea of "peace at all cost" offered by the Copperheads look more desirable. Because of this, McClellan was thought to be a heavy favorite to win the election. Unfortunately for Lincoln, Frémont's campaign got off to a good start. However, several political and military events eventually made Lincoln's re-election inevitable. In the first place, the Democrats had to confront the severe internal strains within their party at the Democratic National Convention. The political compromises made at the Democratic National Convention were contradictory and made McClellan's efforts to campaign seem inconsistent. Secondly, the Democratic National Convention influenced Frémont's campaign. Frémont was appalled at the Democratic platform, which he described as "union with slavery". After three weeks of discussions with Cochrane and his supporters, Frémont withdrew from the race in September 1864. In his statement, Frémont declared that winning the Civil War was too important to divide the Republican vote. Although he still felt that Lincoln was not going far enough, the defeat of McClellan was of the greatest necessity. General Cochrane, who was a War Democrat, agreed and withdrew with Frémont. On September 23, 1864 Frémont also brokered a political deal in which Lincoln removed U.S. Postmaster General Montgomery Blair from office, and on September 24 Abraham Lincoln relieved Blair of his duty as Postmaster General. McClellan's chances of victory faded after Frémont withdrew from the presidential race. Results by county explicitly indicating the percentage of the winning candidate in each county. Shades of red are for Lincoln (National Union) and shades of blue are for McClellan (Democratic). Lastly, with the fall of Atlanta on September 2, there was no longer any question that a Union military victory was inevitable and close at hand. In the end, the Union Party mobilized the full strength of both the Republicans and the War Democrats under the slogan "Don't change horses in the middle of a stream". It was energized as Lincoln made emancipation the central issue, and state Republican parties stressed the perfidy of the Copperheads. 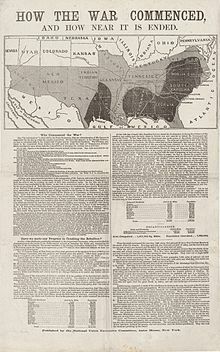 Because eleven Southern states had declared secession from the Union and formed the Confederate States of America, only twenty-five states participated in the election. Three new states participated for the first time: Kansas, West Virginia, and Nevada. The reconstructed portions of Louisiana and Tennessee chose presidential electors, although Congress did not count their votes. Despite Kentucky's state government never seceding from the Union, the Commonwealth had an election participation rate decrease of almost 40% compared to the election of 1860. McClellan won just three states: Kentucky, Delaware, and his home state of New Jersey. Lincoln won in every state he carried in 1860 except New Jersey, and also carried a state won four years earlier by Stephen Douglas (Missouri), one carried by John C. Breckinridge (Maryland) and all three newly admitted states (Kansas, Nevada and West Virginia). Altogether, 212 electoral votes were counted in Congress for Lincoln – more than enough to win the presidency even if all of the states in rebellion had participated. Lincoln was highly popular with soldiers and they in turn recommended him to their families back home. The following states allowed soldiers to cast ballots: California, Kansas, Kentucky, Maine, Michigan, Rhode Island, and Wisconsin. Out of the 40,247 army votes cast, Lincoln received 30,503 (75.8%) and McClellan 9,201 (22.9%), with the rest (543 votes) scattering (1.3%). Only soldiers from Kentucky gave McClellan a majority of their votes, and he carried the army vote in the state by a vote of 2,823 (70.3%) to 1,194 (29.7%). 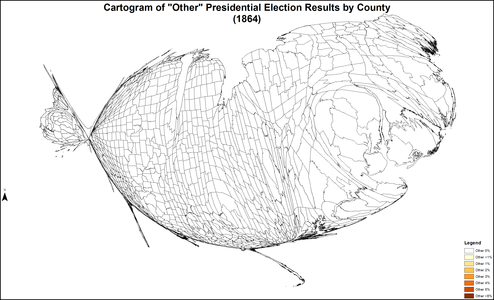 Of the 1,129 counties making returns, Lincoln won in 728 (64.5%), while McClellan carried 400 (35.4%). One county (0.1%) in Iowa split evenly between Lincoln and McClellan. This was the last election when the Republicans won Maryland until 1896. Source (Popular Vote): Leip, David. "1864 Presidential Election Results". Dave Leip's Atlas of U.S. Presidential Elections. Retrieved July 27, 2005. (a) The states in rebellion did not participate in the election of 1864. (b) The electors from Tennessee and Louisiana were rejected. Had they not been rejected, Lincoln would have garnered 229 electoral votes out of a total of 250. (c) One elector from Nevada did not vote. 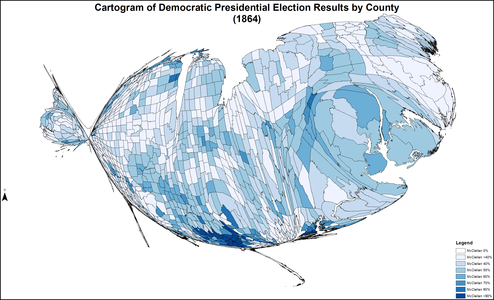 Source: Data from Walter Dean Burnham, Presidential ballots, 1836–1892 (Johns Hopkins University Press, 1955) pp. 247–57. Source (Popular Vote): Leip, David. "1864 Presidential Election Results". Dave Leip's Atlas of U.S. Presidential Elections. Retrieved July 27, 2005. Source (Electoral Vote): "Electoral College Box Scores 1789–1996". National Archives and Records Administration. Retrieved July 31, 2005. 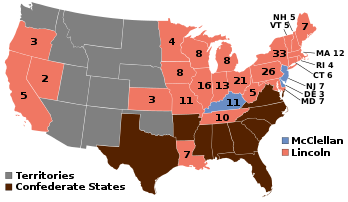 States in red were won by Republican Abraham Lincoln; states in blue were won by Democrat George B. McClellan. ^ a b Elections were held in the Union-occupied military districts in the states of Louisiana and Tennessee, but no electoral votes were counted from them. Including these two states increases Lincoln's states carried from 22 to 24 and the total participating states from 25 to 27. Donald, David Herbert; Baker, Jean Harvey; Holt, Michael F. (2001). The Civil War and Reconstruction. New York: W. W. Norton & Company. p. 427. ISBN 9780393974270. ^ Davis, William C. (1999). Lincoln's Men: How President Lincoln became Father to an Army and a Nation. Simon and Schuster. p. 211. ISBN 0-684-83337-9. The public entrusted Lincoln with another term in spite of widespread revulsion at the death toll in the Wilderness Campaign. Republicans had found success in gubernatorial races in Ohio and Pennsylvania by attracting the votes of furloughed soldiers. In order to copy the same success nationally, thirteen Union states allowed their citizens serving as soldiers in the field to cast ballots. Four additional Union states allowed "proxy" absentee voting. "By margins of three to one or better, the soldiers [lined up] behind Lincoln." In every state, those returning home influenced their friends and family. For an alternative account of army voting, see W. Dean Burnham, "Presidential Ballots: 1836–1892", pp. 260–83. Out of the 40,247 Army votes cast in seven states, Lincoln carried six of them with 30,503 votes (75.8%). ^ "Abraham Lincoln: Campaigns and Elections". American President: A Reference Resource. University of Virginia. Retrieved November 20, 2016. ^ Martis, Kenneth C., "Atlas of the Political Parties in the United States Congress, 1789–1989" ISBN 0-02-920170-5 p. 117. Altogether they elected 9 Senators and 25 Representatives in Missouri, Kentucky, West Virginia, Maryland and Delaware. ^ George Pendleton. Ohio History Central (May 23, 2013). Retrieved 2013-08-17. 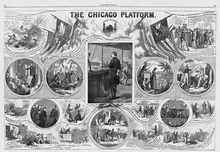 ^ "Democratic Party Platforms: 1864 Democratic Party Platform". ^ "George B. McClellan". Ohio History Central. Retrieved March 6, 2007. ^ "HarpWeek: Explore History, 1864: Lincoln v. McClellan". Retrieved May 31, 2010. ^ US President – IR Convention Race – May 31, 1864. Our Campaigns (January 13, 2008). Retrieved 2013-08-17. ^ Lowe, Robert E. (2016). "Lincoln, the Fall of Atlanta, and the 1864 Presidential Election". Georgia Historical Quarterly. 100 (3): 260. Retrieved February 14, 2018. ^ Randall, J. G.; Current, Richard (1955). Lincoln the President: Last Full Measure. p. 307. ISBN 9780252068720. ^ "Presidential General Election Results Comparison - Kentucky". Dave Leip's Atlas of U.S. Presidential Elections. Retrieved February 25, 2019. Balsamo, Larry T. "'We Cannot Have Free Government without Elections': Abraham Lincoln and the Election of 1864", Journal of the Illinois State Historical Society (2001): 181–99. Fehrenbacher, Don E. "The Making of a Myth: Lincoln and the Vice-Presidential Nomination in 1864". Civil War History 41.4 (1995): 273-290. Long, David E. Jewel of Liberty: Abraham Lincoln's Re-election and the End of Slavery (1994). Allan Nevins, Ordeal of the Union: The War for the Union vol 8 (1971). Newman, Leonard. "Opposition to Lincoln in the Elections of 1864", Science & Society, vol. 8, no. 4 (Fall 1944), pp. 305–27. In JSTOR. Phillip Shaw Paludan, The Presidency of Abraham Lincoln (University Press of Kansas, 1994) pp. 274–93. James G. Randall and Richard N. Current. Lincoln the President: Last Full Measure. Vol. 4 of Lincoln the President. 1955. Vorenberg, Michael. "'The Deformed Child': Slavery and the Election of 1864" Civil War History 2001 47(3): 240–57. Jack Waugh, Reelecting Lincoln: The Battle for the 1864 Presidency (1998). White, Jonathan W. "Canvassing the Troops: the Federal Government and the Soldiers' Right to Vote" Civil War History 2004 50(3): 291–317. White, Jonathan W. Emancipation, the Union Army, and the Reelection of Abraham Lincoln (Baton Rouge: LSU Press, 2014). Winther, Oscar O. "The Soldier Vote in the Election of 1864", New York and History Pages and do (1944) 25: 440–58. Leip, Dave. "1864 Presidential Election – Home States". 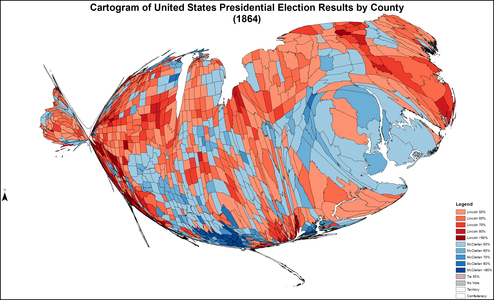 Dave Leip's Atlas of U.S. Presidential Elections. Retrieved January 11, 2009.